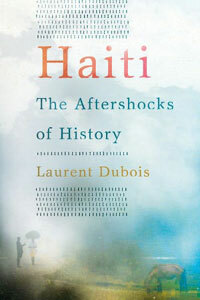 Review of Laurent Dubois, Haiti: The Aftershocks of History, Metropolitan Books, 2012, 418 pp. The Haitian people have been at the forefront of many of the events that shaped the modern world. They staged the first and only successful revolution against slavery, intersected with a profound agrarian reform. They faced down the barbarity of the U.S. military occupation of 1915-34 and ultimately drove the occupiers out. The worker/student/peasant uprising of 1946 against President Élie Lescot was the first successful overthrow of a U.S.-backed regime in the Americas. The popular mobilization of 1986-90 that culminated in Jean-Bertrand Aristide's first election to the presidency in September, 1990 was the first to frustrate the strategy of U.S. imperialism in the 1980s of promoting ‘democracy’ in the form of sham elections while dangling the bait of foreign aid. Haitians have suffered mightily for repeatedly defying and defeating the imperial order. As if that were not enough, they suffered a new and unbelievable tragedy with the earthquake of January 12, 2010. The evident weakness of the Haitian state, troubling to many following the 2010 earthquake, is largely a consequence of the incessant interventions of the world's big powers. Born into a world dominated by slavery, Haiti was shunned by all the wealthy countries in the nineteenth century. France imposed a crushing Independence Debt in 1825 as a condition of diplomatic recognition and trade. Financing that debt led, in turn, to deeper financial enslavement to French and then U.S. banks. The U.S. did not even recognize Haiti until 1862. Then there came the violent and bloody 1915-1934 U.S. military occupation. This history is already well documented, but much of it lies in books that may be out of print or heavily academic. This book brings the history alive. What interests the author is to probe the social and political relations that took hold in the new republic following independence in 1804, how they endured, and how they shaped the country for many years following. Haiti’s struggle for independence was at one and the same time a profound social revolution. Following independence, a deep-going agrarian reform for small holdings unfolded, propelled by the former slaves. Its repercussions echo in modern times. Try as they might, Haiti’s new leaders were unable to preserve large-scale agricultural production. Those who fought for their freedom refused to accept new forms of exploited labor. “Haiti’s rural population effectively undid the plantation model,” explains Dubois. They did so at the cost of a voice in political decision making. Whereas the 20th century agrarian revolutions in Russia, China and elsewhere in Asia fought for a government and state that could serve and enhance agrarian interests, the overriding sentiment in 19th century rural Haiti was to keep the government out of the countryside. Why would it be otherwise? As Dubois explains, one could do far worse in the world of the 19th and early 20th centuries than to live in rural Haiti. In any event, the material and political conditions for a government that could take robust measures to promote agriculture on any kind of egalitarian basis were absent in Haiti and increasingly unrealizable. To the Haitian peasant, an elite-led urban government meant nothing more than taxation, disruption of village life and perhaps worse, the loss of land. It would take the U.S. military occupation, more than 100 years following independence, before significant inroads into small scale peasant agriculture could begin, including the all-important ban on foreign ownership of land. Aftershocks is a rich history of this entire period up to the ignominious end of the occupation. The author has a real touch in bringing the Haitian people and some of their greatest thinkers alive in his pages. We learn of leading Haitian intellectuals and political leaders such as Anténor Firmin, Jean-Price Mars, Dantés Bellegarde and Joseph Jolibois. A favorite passage of this reviewer is Dubois’ description of the standoff in 1891 between Haiti and the U.S. navy over the drive to establish a permanent U.S. naval base at the harbor of Môle St. Nicholas on Haiti's northwest tip. Then-foreign minister Anténor Firmin cables Haiti’s ambassador in Washington to ask how seriously the government should treat the U.S. warships threatening to bombard Port au Prince if Haiti does not cede. Dubois cites the ambassador’s cable reply. Reading the political climate in the U.S., he wrote, “The fleet is for the purpose of intimidating. Do not yield. Nothing will happen.” He proved right–the government stood firm and the fleet withdrew. The United States never succeeded in acquiring Môle. Aftershocks does disappoint in the brevity of its treatment of the later twentieth century. The 1946 uprising is treated most briefly; the important labor and political leader Daniel Fignolé gets only a slight mention. The essentials of the Duvalier years are covered, but post-1986 Haiti is too briefly summarized. There is a puzzling absence of treatment of the coup d’etat against the second government of Jean-Bertrand Aristide in 2004. Surely this event, so crucial to understanding the impact of the earthquake and the difficulties of post-earthquake Haiti, fits into the trajectory of imperialist intervention described so well throughout the book. Dubois authored the 2004 Avengers of the New World, described by historian Robin Blackburn as “among the handful of indispensable books on the Haitian Revolution.” Haiti: The Aftershocks of History joins that volume as a highly valuable companion piece. The new book will serve the Haitian people and students of Haiti well in the difficult years ahead.